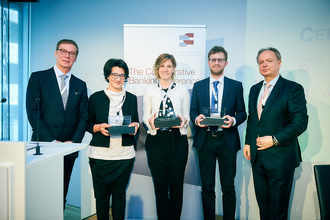 In June 2016, the EACB issued, in collaboration with the European think tank on co-operative banks (Think Tank on Co-operative Banking), a Call for Papers for the fifth EACB award for young researchers on co-operative banks. The purpose of this award is to stimulate research on co-operative banks and the fundamental role they play in the real economy. Ulrich HASKAMP, Spillovers of Banking Regulation: The Effect of the German Bank Levy on the Lending Rates of Regional Banks and their Local Competitors. Ivana Catturani and Erika Dalpiaz received their prize during the EACB Convention on Co-operative Banks held in Brussels on the 28th of March 2017.